Looks like after many phone calls and emails we were finally able to come to a conclusion on how to start the Panamericana. Matteo has decided to ship his 1985 Honda Dominator to Panama. I will depart from Canada solo. In August 2013 we will be crossing the Darrien gap together into Colombia. 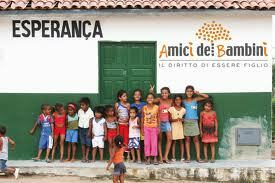 We will then go visit and meet the children with the administrators of the project we chose to support. We would like once again to thank all of you for making this possible with your generous donations. This institute hosts about 150 girl children between 6 and 18 years of agewho have been the victims of violence, abuse and exploitation. Since May 2010 this structure has been managed by the Por un Mundo Nuevo Foundation. Thanks to the “La Fabbrica dei Sogni” project, launched in September 2009, some of the children hosted in this structure can now attend theatre and music classes and participate in specific play days and excursions outside the institution. We are preparing the “ABC room” on the premises: it is a play room and teaching room in one, where it shall be possible to involve the families of origin of the institutionalised children and promote their becoming acquainted with their children. I have to admit that starting the American continent without Matteo is a bit sad for me. After traveling together from Italy to Japan across countries such as Mongolia, the relationship that developed between the two of us is an amazing one. I feel very fortunate to have met this special person one day travelling through Turkey a few years back. He is a true friend to me. I can’t wait for August to arrive so he will be back and able to continue this fantastic journey around the world. To get to Panama is a long stretch. I am still in Victoria BC. The departure is set for the end of February. My good friends Lee and Matthew are planning to accompanying me on this journey through Central America . This is great news for everybody. They have joined us on the “Crusade to help children around the world on motorcycle”. I have travelled with Lee and Matthew to Inuvik on the magical Dempster Highway and Alaska in 2010. I can’t ask for better people to travel with. Matthew is a fantastic cook and has the ability to transform anything in a superb dinner by the campfire. Lee is set with a great positive attitude which will be an assets in times of difficulties. With Lee, I have travelled all along the northern coast of British Columbia on various fishing trips. Absolutely amazing remote places that i fell in love with. At the bottom of this post I have added some photographs of these remote BC places.Matthew and I, on the other hand, travelled in eastern Europe together by motorcycles (Turkey,Bulgaria,Romania,Ukraine,Poland,Hungary). Lee and Matthew, helped us with their donations in the past, but now they will put some sweat with me and Matteo as well. Please use the “Contact us form” to show your big welcome to Lee and Matthew to the team. Matthew will be riding a BMW 1200 GS while Lee has a KTM 690 Enduro R just like mine.